Potato cyst eelworms are microscopic plant parasitic nematodes. They are serious and widespread problem of potatoes and tomatoes especially in allotments and gardens where the host plants have been grown frequently. What are potato cyst eelworms? Eelworms also known as nematodes, are a phylum of worm-like animals. They are very abundant and occur in almost every habitat from terrestrial to aquatic environments. Nematodes feed on a range of materials, some are predatory on bacteria whilst some are plant or animal parasitic. Plant parasitic eelworms are microscopic in size, typically 1-1.5mm long. The two species of potato cyst eelworm that commonly occur in Britain - golden or yellow cyst eelworm (Globodera rostochiensis) and white cyst eelworm (G. pallida) - feed in the roots of potatoes and can cause the crop to fail. They can be distinguished by the colour of the developing cysts which are just under 1mm in diameter. The golden or yellow cyst eelworm passes through a prolonged pale yellow phase, these can be seen if roots are examined between mid-June and July. The cysts of the white cyst eelworm change rapidly from creamy-white to brown. Golden cyst eelworm is the more common species in the southern half of Britain while the white cyst eelworm predominates in the north including Yorkshire and Lancashire, and also much of Lincolnshire. Initially, crops display patches of poor growth and affected plants may show chlorosis and wilting, with poor top growth. These symptoms develop from the ground upwards. If an affected plant is lifted carefully, it should be possible to see many pin head-sized spherical objects, known as cysts, on the roots. Eelworm cysts are the dead bodies of females which can contain 200-600 eggs each. The cysts may be white, yellow or chestnut brown in colour and can be seen more readily with the aid of a hand lens. Heavily infested plants die prematurely and yield a poor crop of under-sized tubers. When an area is first infected by potato cyst eelworm only a small part of it may be affected but in successive years the infested area will enlarge until it becomes impossible to grow worthwhile potatoes. The eggs contained within the cysts can remain viable for many years as they hatch at a slow rate in the absence of host plants. When potatoes or tomatoes are grown in infested soil the eggs are stimulated to hatch in large numbers by chemicals exuding from the roots. The immature eelworms are microscopic worm-like creatures which enter the roots and feed internally on the cell contents. During their development the eelworms disrupt the uptake of water and nutrients, causing stunted growth and poor leaf colour. When almost mature, the female eelworms become globular in shape and burst through the root wall and are then fertilised by males. There is one generation a year on outdoor crops but two generations may be possible on glasshouse tomatoes. Wild plants of the Solanaceae family are rarely attacked and are of no importance as host plants in the UK although some, such as the weed black nightshade (Solanum nigrum), will induce egg hatching from the cysts. There are no pesticides available to home gardeners which will control potato cyst eelworms, and so cultural methods should be used to avoid spreading the pest and to reduce infestations. A high population of cysts may soon develop if potatoes or tomatoes are grown frequently in the same piece of soil. This can be avoided by adopting as long a rotation as possible. Self-set or 'volunteer' potatoes can maintain an infestation and so weed them out in early summer before eelworms can complete their development. Eelworm eggs can survive for up to ten years in some soils and so very long rotations are needed to starve out the pest completely. 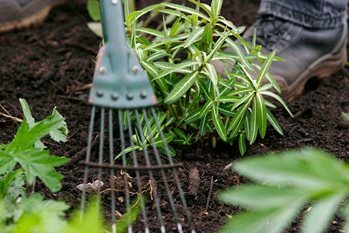 This process can be speeded up by sowing a half-hardy annual, Solanum sisymbriifolium. This plant’s roots induce egg hatching but eelworms cannot develop in the roots. Suppliers can be found via RHS Find a Plant. A worthwhile crop of early potatoes can usually be grown in infested ground after a break of five or six years. The increase in cyst numbers can be limited by lifting the crop as soon as the tubers are ready and not allowing the plants to continue growing beyond that point. The root exudates produced by these cultivars still induce egg hatching and the roots are attacked in the usual way. Females, however, are unable to develop inside the roots and only males are produced, thus reducing the number of eggs in the soil. White cyst eelworms can reproduce normally on these varieties. Crop rotation is still important, even in areas where the golden cyst eelworm predominates, as there is a danger that the other species may also be present and will increase in numbers if potatoes are grown too frequently. The white cyst eelworm is able to complete its normal life cycle and reproduce in the roots of these varieties, but they are nevertheless able to produce a worthwhile crop, provided the soil is not heavily infested. Soil that has grown potatoes should never be used in the greenhouse for growing tomatoes. If greenhouse beds become infested, the problem can be overcome by complete re-soiling, or by growing tomatoes in raised beds, growbags, or other systems, such as ring culture, or straw bales, which reduce root contact with the infested soil.